“Make peace with your situation. It usually could be worse. Feel grateful you are alive with a smile to share. Life is too short to hide your shine.” Love this, great words to live by! Thanks, Jen! Having gone through a lot this year, it took a while for me to get my “shine” back…. but now that it’s back, it is here to stay. Shine ON! reading this today just put everything into a total new perspective!! I myself lost 3 of my front teeth in a car accident when I was 17, I was always ashamed and embarrassed about what had happened to me. Reading this blog today really just gave me a whole new outlook on the situation and how I should really be looking at it. Considering 8 people lost their lives in the accident I was lucky to only have lost what I did. Thank you so much Carlyn you seriously will never know just how much of a blessing this was for me to stumble upon today! Ah. You. I feel very humbled. I guess I need to go back to my corner and reconsider the “severity” of my situation. Because its really not severe at all. Its kind of a petty anxiety, actually. You, toothless eye opener. Love! Wow…thank you so much for this wonderful post. I’m sorry to hear about your accident, but I am so inspired by your courage with how you have handled it…amazing! I lost my left front tooth back in 2008 (age 34 at the time) and went through this same experience (minus the painful accident part…mind was the result of a frozen strawberry and a baseball that hit my face back in 1992). I didn’t show anyone (except my wife) what I looked like without my tooth in (I didn’t get a flipper, but had the actual crown of my tooth glued in while the implant process went on). It did fall out once at an airport and that was quite an interesting experience. Anyway, it was traumatic and also a blessing on many levels. Losing my hair has also been quite painful, but also such a growth inducing experience. As a 40 year old man, I’m still working on embracing myself physically…I have better days than others. I think we focus too much on the external in our culture in so many ways and we miss the deeper issue…it’s about loving, accepting, and making peace with who we are, how we look, the things that happen and change in our lives, how we age, and more. I honor you for your courage and vulnerability! reading this truly brings tears to my eyes. thank you so much for sharing with me that I made a difference in your day, I really hoped that by writing my story that others would get something out of it. Cindy, I can not imagine what you have gone through, but you are a brave woman and truly blessed to be able to rock your beautiful smile. It really is a new world with a new perspective! Proud of you. No matter how “sever” a situation is, it is YOUR situation, and you are entitled to feel strongly for it. But, if you can find a new perspective, in that YOU are not your story, it is merely a small part of you… well, your problem will inevitably get even smaller 🙂 Love YOU! Mike, WOW, hats off to you for stepping out and sharing this with me & all who take the time to read it. It’s funny… the aging process. Society tries to convince us that “growing older” is a bad thing… or our genes aren’t good enough… and we can pop a pill, or nip/tuck, etc… and we will feel more acceptable. Sure, there are ways to stay younger looking– eating healthy, protecting skin from the sun, regular exercise and a healthy attitude, but at the end of the day, we are BLESSED to grow old! So many people die far too young and would give anything to have a wrinkle or grey hair. Plus, our parents made us. We are DNA. Everyone’s is different. It’s a shame society puts so much emphasis on being “the same” when really we should celebrate our uniqueness– ha, it’s way more fun and far less stressful… 🙂 THANK YOU for your feedback, it is a confidence booster for me. And yea, it’s OK that you were embarrassed about your tooth, it’s tough, I get it. It’s all about living and learning 🙂 Cheers to our Journey!!!!! Very inspiring and well said! Lori, I am SO SORRY it has taken me over a month to respond to you! First of all, we are the same age 🙂 Second of all, by you taking control of your health and your teeth, you are helping yourself heal from the trauma you have carried with you for 21 years. I can only imagine how scary that was; lucky for me I do not remember being thrown off my bike as it happened so fast! This blog post made me feel a bit better. I lost my two front teeth on New Years Eve and have been feeling a little down since then. Good to see you were able to have a lot of fun with it. Luckily you already had a boyfriend. What girl is gonna be okay with a dude that has a toothless grin?? What a great post! I am a “recovering dentist,” so I was particularly interested in it, and I have to say the part where you thanked your dentist and oral surgeon gave me warm fuzzies! Losing your teeth like this creates such a huge sense of loss. You handled this so well, and have such a great attitude. I love that you don’t try to hide it. There is nothing to hide, and you see that your friends probably respect you more for being real. Isn’t it amazing how when you open yourself up and be real and be yourself, many people will come out of the woodwork to let you know they care about you? It’s one of the beautiful things about people. Anyway, I saw your link to your blog on Nextdoor, and I had to come check it out. I love it! Thank you for sharing and making me smile! I’m dealing with the same issue right now and needed to hear your sweet words! I was depressed and insecure for years about my missing tooth and flipper. It has been my little secret for 3 years, since the tooth has been gone, only my husband knows I wear a flipper. 😉 today I feel a bit more secure, thank you! Hi Veronica! Thank you 🙂 Did you lose your teeth? If you did, I hope you are still smiling. My take is a bit different. I think the upbeat attitude is only as good as the hope to fix the problem and replace the teeth. If you know you can afford implants, the only real solution, then of course you will know this horror will eventually be in your past. However, many many people can never even dream of a permanent solution to their tooth loss. It is not so easy to maintain an upbeat attitude about a disfiguring loss which also impedes the ability to eat properly when one knows it will be forever. Hi Aaron, I can’t say that i don’t agree with you. I wanted, and still want to be, an advocate for dental work and fight for those that need teeth! It is NOT fair that they are “cosmetic”. I sat with a homeless vet missing the SAME teeth and we talked about this very thing. Yes, knowing there was light at the end of the tunnel helped me process the loss. But,I did not know this light in the first few weeks.I really had no idea what the outcome would be. And in that first week, being disfigured and not easy on the eyes, I still went out and held my head high and smiled as best I could. And that helped me to feel more confident. I actually had to get used to having teeth again. They felt very claustrophobic for the first few weeks. I was used to not having them. It was so weird. At the end of the day, everything is a choice. We might not have the best “options” but we do have choices. Thanks for sharing your thoughts with me 🙂 Cheers to the journey, friend. Girl… that cup of coffee this morning was good fuel for writing… I love this and it is so aligned with my current challenges. Way to embrace the journey… its definitely inspiration to embrace mine. The outcome is never good if we try to fight what life dishes up. Surrender and make lemonade out of lemons. Can’t wait to hear about your trip when you return! Tricky– Receiving stories like yours, make my day! Love that you own your stylish self and laugh with life! Thank you for being you! I have read that I have to make “buches” with warm water and oxigenated water three times a day because it is an effective antiseptic. The worst thing of all is that I have always been quite a perfectionist so I can not tolerate to have my mouth like this at all!!! I feel ugly, old and untidy. I have always thought that teeth fell out only when people grow very old, naturally… But my accident has sped this process… As you can see IÂ´m totally hopeless and depressed ( And bear in mind that this unfortunate event happened SEVEN YEARS AGO!!!!!!!!!) It has been totally traumatic. What can you suggest I can do? Please write to me , I feel I will immediately feel better. Thanks beforehand. And sorry for my imperfect English! 🙂 Vero from B.A. Hi! I am 15 years old,a dnI recently had to have my front tooth removed because of a messed up root canal 6 years ago. Your blog really inspired me, because being 15, I care what people think of me. Your post really changed my perspective. Thank you for sharing! Carlyn, Thank you for your sharing your story. I did not have the proper dental treatment as a child. I lost two of my teeth # 6 and 10 at age 18. The dentist made a permanent bridge did root canal work on my two front teeth and off I went. I was young and did not understand I thought “things” where fixed. As I got older I began to fully comprehend the magnitude of this problem. Yes we can compare tooth loss to other losses; people lose legs, arms, etc. However, that does not make losing your front teeth less physically and emotionally painful. I think we must first acknowledge the loss. We need to over come the shame, guilt and embarrassment. That is an on going journey because our face is what we notice immediately. I want to be a whole person not broken I want the teeth that I was meant to have. I am now in the process of getting another implant for tooth #8 which had to be removed because of a bad root canal. Once again I get the same feelings of loss and shame. I know this is a process and this too will pass but the journey is not easy and only those people who have had the loss fully understand. Thank you for all your comments because I think the support is the healing journey that helps us to arrive a place called peace. Teri, I’m so happy my words spoke to you. I posted this video 3 years ago and I’m still amazed when someone finds it and shares their story with me. I love being a catalyst for self acceptance and peace. I also had a root canal on my right front tooth that is now dying. Plus my gums are really grey, I guess from blood loss, but the discoloring is hard for me to ignore, same with the white scar on my upper lip that gets whiter with the sun or the cold. But, this is just a part of us, not all of us. Some days I actually miss the ability to take out my teeth <3 sending you lots of love! If you want additional support during this time in life -- this is the work I do now, it is my purpose. I'm offering a end of year special for 2017 and start for 2018 -- and launching group programs to connect us all to build confidence and connection rather than hiding and shame...and would be happy to share the info with you! Thank you Carly for the support. I believe after I found your sight I started feeling better about loosing #8. I already had a post on tooth #7 and I suggested to the Dentist to connect tooth #7 & 8 with a Porcelain temporary. It looks great, I had to pay extra but to feel normal for the next 4 months was important to me. I did not want to wear the flipper. Another thing that helped was getting the anesthesia for the removal of the tooth. The removal and implant were done at one time. So in by the end of April I can get the final tooth in place. At that time the doctor will separate 7 & 8. I am fortunate that I can afford these procedures. It is not fair that tooth replacement is considered cosmetic to the insurance company. Yes, I am looking forward to your programs. Your humor and loving caring makes all the difference. Keep up the good work and I wish you all the best with your on going dental issues. I would go to a periodontist to check out the the grey color, doesn’t seem right. You are a wonderful young lady, thank you for caring about all of us. Happy Holidays! Thank you for this. I recently got into a rugby accident; a high tackle (which is a huge penalty), a forehead to my mouth. I wearing a mouth guard. After the hit, my mouth guard fell out, and when I closed my mouth- I couldn’t, I realized my teeth were not where they should be but pushed backwards. It turns out the forehead to my mouth fractured my plate above my mouth knocking my two front teeth backwards. I was submitted into emergency and thankfully had my teeth pushed back somewhat into place. Dentists are saying I will most likely still lose my front teeth due to trauma. It has been a month, I just started biting down on food again, and my teeth are being monitored. I personally would rather have them pulled out right now- so I can stop this worrying and go back to playing the sport I love(it sounds crazy, I know.). If my teeth end up surviving I will most likely not go back to playing anytime soon…in fear that this will happen all over again. I have been very emotional, I would not want this happening to anyone; losing something you love to do and something taken from your appearance. 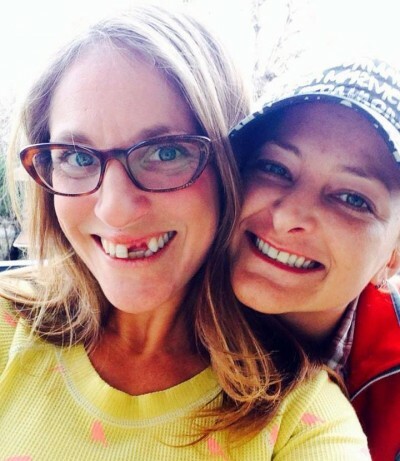 I googled “what losing your two front teeth is like” and came across your post. I bawled my eyes out but here I am smiling in the end. I may have not lost my teeth yet but it is expected to come. Thank you for your strength and wisdom. I hope that I still have a killer smile like you do when I lose my teeth my teeth. I’m so glad I came across this. I’m going to lose an eye tooth soon due to a bad root canal and I’m mortified it’s very visible but I know there people who have so many worse things in life. But losing a tooth or teeth does affect ones self confidence. I love that you said smile even if you don’t have teeth. It’s such a great outlook on life. I like that you are bringing us all together. Thanks Carly! Hi, I read this post three years ago when i was looking for someone going through the same thing as me. At that time I was 16 and had just lost four of my frontal teeth in a bus accident, I felt awful and your post really helped me to feel like someone understood me and made me try to find the positive side of my situation, I dont know why I didn’t commented back then but just now i’ve been told im gonna finally get my implants surgery (after two years of brackets to get my other teeth ready for the implants) in a few months and I started to look at some posts about it and found this one again. P.S: sorry if my english is wrong, im actually from Chile. I’m so glad you found this when you did!!! I assume you already had the tooth removed? How is your smile these days? PS- I have a bad root canal on ANOTHER front tooth (result of the accident) and might need to go through my process of being toothless all over again! Hi- I am dealing with a very similar situation. I was recently hit by a car and lost my three front teeth. I’m having a really hard time coping, given that I went through years of braces and surgery to get my perfect smile and now it’s gone. Just like that’. I am so glad I came across this site. I had been looking for a group of people and support group that has experienced the same trauma that I have been battling. I was a healthy 52 year old woman with no experience with root canals and crowns before I had the electric scooter accident in LA just this past August. I lunged to the pavement and one of my front tooth #8 was knocked out. So many regrets and why the heck did I get on that thing at my age. The tooth that got knocked out was still in one piece and my husband, about an hour after the accident, googled and saw that the tooth could still possibly be saved. I inserted it back in the socket and went to the emergency dentist who bonded my 6 front teeth. Nothing has felt the same since then. The bonding was on for 6 weeks, the bone fused to the root of the tooth so it did reattach and it feels probably like an implant, solid, just not natural. I’ve had a root canal on the tooth and the other (#7) one next to it. I ended up getting crowns on these two teeth because I didn’t place the reattached tooth the right way and the other tooth got pushed in so they were both causing me misery by not being in the right positions. Another tooth (#9) is now struggling to survive and also does not feel the same. It’s been really hard the last 4 months, depression, anxieties, fear, lack of sleep. My dr says this is all from the concussion. I just feel terrible, nothing feels the same with my teeth, the way they feel, eating is different, bite is different, it’s all been creating havoc with my nerves. All of this has affected my health negatively and sometimes I don’t know how to overcome this. Maybe it would have been better that all of these damaged teeth were out so that I don’t feel everything that’s going on with them now. How do you get through this? I’m so glad I found this, I’m 27, and having my left front tooth removed in 3 days after having 2 surgeries over the last 4 years in the area to remove cysts and try to save the tooth. I’m DEVASTATED, been crying about the thought of having my smile destroyed, the thought of talking weird with a flipper while waiting to see if the bone can heal enough to support an implant – I’m grateful I have a choice in my treatment, not going through this due to trauma, and trying to keep perspective that it could be so much worse – but hearing your story has made it much easier for me to get ready for this, and reminded me that it really will only be as big of a deal or as upsetting as I make it. So thank you. Hi my experience I have to say has been really traumatic. I had a cap on my front tooth after my boyfriend punched me we split after. Years later the part of the tooth left had to be removed and I wore a denture. It hurt I couldn’t eat but the worse thing is it’s a constant reminder of that relationship and that time. When my fake tooth was put in it was the time as my marriage breaking up which dented my confidence even more. Three years in I am extremely depressed about it I look young but feel old. I am a single mum I haven’t a relationship for three years beachside of the worry about kissing and being intimate with someone. I am saving now for a bridge and hope this period of my life comes to an end and I can live confidently again. Marnie, though I wish these stories were not a part of your life, I know, deep down, you truly are a strong and confident woman. Being in a relationship does not define your worth. And the right man for you will not judge you for a past but be grateful to have you be your true self in the present. Depression is hard, I struggle with it myself at times. I remind myself to “just keep swimming” and whatever we are going through we are meant to go through in order to learn and move forward to become our best selves. Glad you found my blog. Sending you love! Nikki! How did your surgeries go? Are you smiling? I am so happy my story helped you feel easier about your own story… at the end of the day, what happens to us is only as devastating as we allow it to be. You’ve got this! Omg just found out I am going g to lose my 2 front teeth devestated !!! So glad I found this. I have root absorption from and accident. I have to have 4 teeth removed from the front tomorrow with implants. I am terrified of the surgery and what I will look like after. I just recently had to lose my front tooth, thanks to an accident I was in 16 years ago. I applaud your bravery and your zest for life in the situation, because I am barely getting by. I was bullied for years for the ways the dentists tried to make my front tooth look better, I was called “blue tooth” and “messed up mouth” and an entire plethora of things that my mind will never forget. I hope that God will instill in me the hope and love he has in you, because at this point I’ve stooped to self loathing and wanting to disappear. I got laid off about two months ago, and every guy I’ve seen a future with is always gone in a flash, so picturing me going into an interview like this or a first date is literally giving me nightmares. You are an inspiration to all of us and especially me because you have owned your situation and made the best of it. I can only dream I will get there someday and not feel so ashamed of myself (thanks to the 8 year old me who was trying to make her step brother laugh and got knocked out by a plastic swing). You’re story is inspiring and I’m really grateful to read stories like these because it reminds me I’m not alone in this.